Today I am super excited because I have a fun diy to share with you guys! A few weeks ago I was contacted by PartyPail and was given the challenge to create a craft project using there party supplies. I love a good challenge and this was one that sounded like alot of fun. So I made some sketches, requested some supplies and went to work. For some reason in my mind I felt like I was on some sort of craft reality show because I was sitting at my kitchen table with all my supplies ready to create ''that project'' out of all those ''weird'' materials (am I the only one who has these moments?) . Anyway, after some testing I came up with a project that would be great for either a party or just for home decor. This project, is a paper plate chalkboard wall! I loved how it turned out and from a distance it doesn't even look like paper plates (which I think is pretty cool). 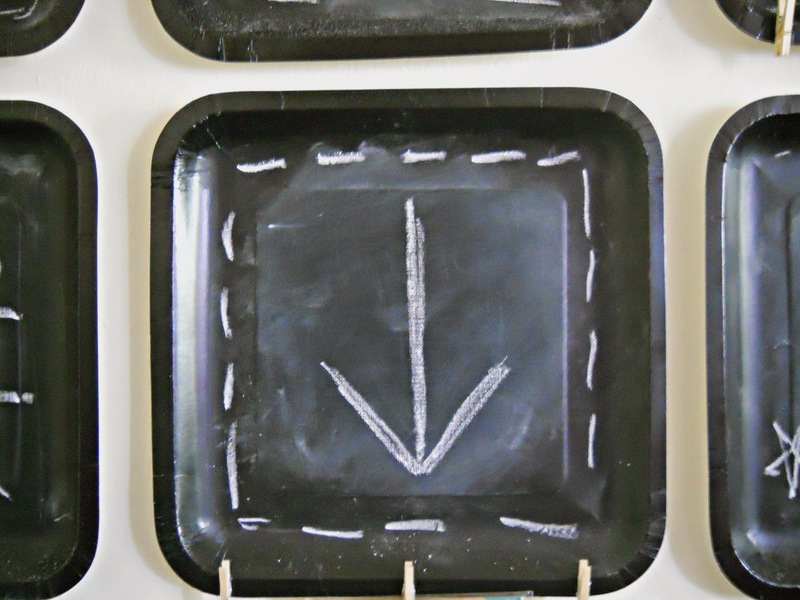 Step 1: Paint the inside of your paper plate with chalkboard paint. I only painted the inside of the plate and little bit of the inside edge (I didn't cover the whole plate in chalkboard paint). 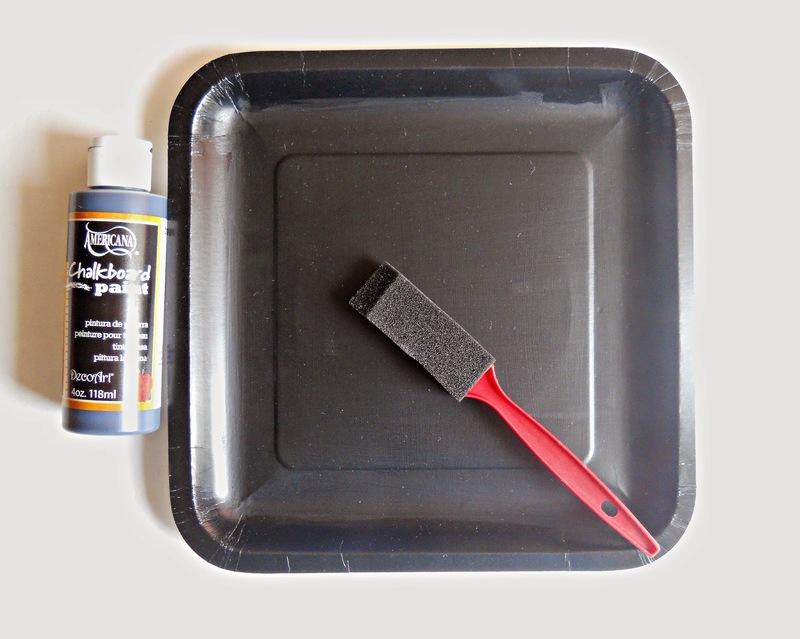 During this step you want to follow the directions on the chalkboard paint you are using. 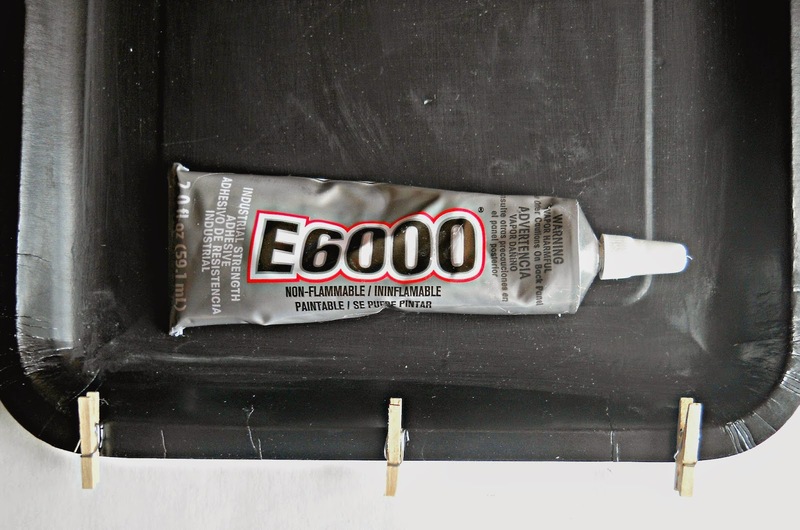 Some paints have different drying times and a set number of coats you should paint. For this project I ended up painting four layers of chalkboard paint with each layer going a different direction (the first layer I painted vertical, the second horizontal and so on). Between coats I let the paint dry an hour and then (once all four coats were dry) 24 hours for the thing to cure. Again just follow the directions on your chalkboard paint bottle. 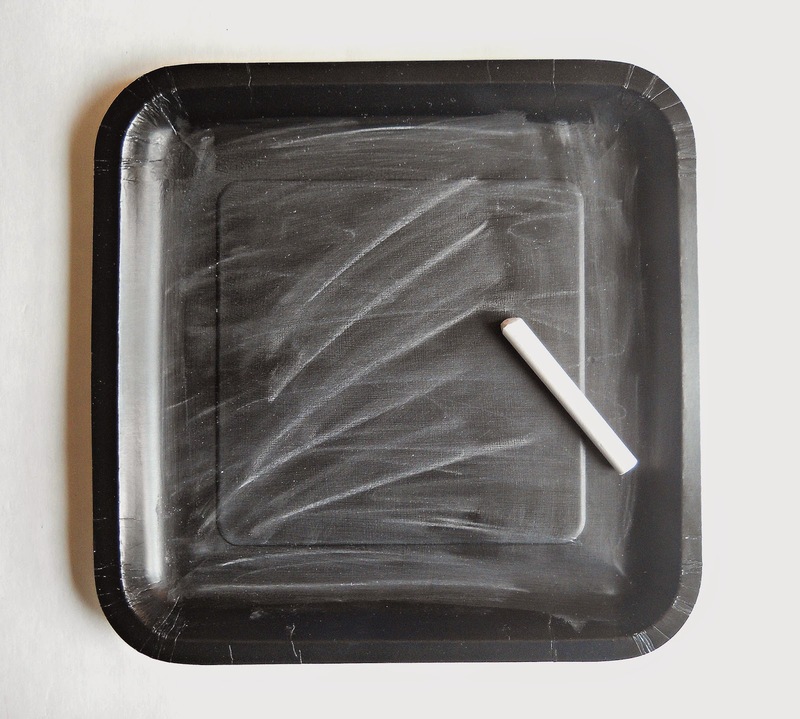 Step 2: Once your chalkboard paint is all dry, take a piece of chalk and write/smear chalk dust all over it. Then take a damp cloth and wipe the chalk off. Now your chalkboard is ready to be used. Step 3: Now take some of your plates and glue some mini clothespins at the bottom. Let them dry. Step 4: Take your lipstick tube and take off the cap. Clean it out, turn it upside down and glue it to the edge of one of your plates. By doing this, you have now creating a little holder for your chalk. When all your plates are dry, take some command strips and place them on your wall. 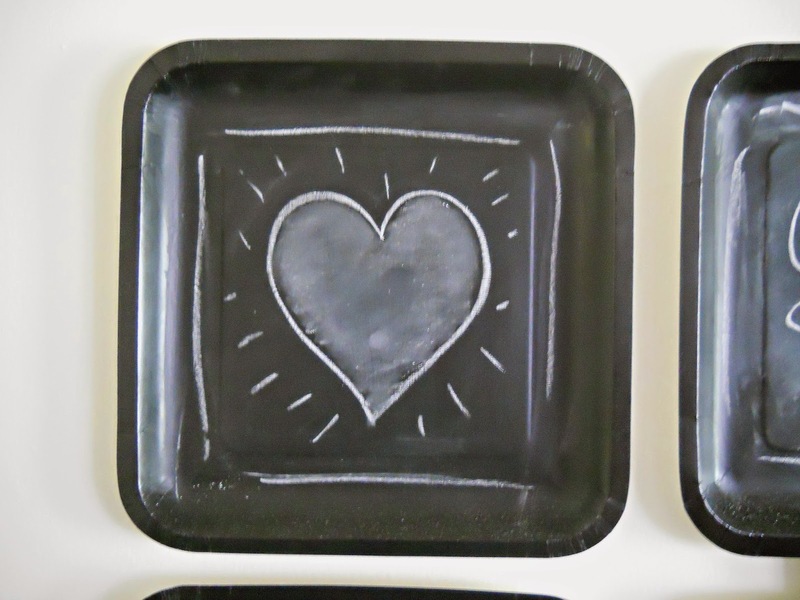 Once your happy with the look, your ready to start using your new chalkboard! Besides parties and home decor, I think this project would be great for dorm rooms or for any young adult who is trying to decorate there space on a budget. Another nice thing about this project, is that you can customize the whole thing to fit your style. For this project I used 9 inch square plates but you could use smaller plates, round plates, different colors or do some sort of combination. PartyPail has such a great section of colors and sizes for all there products. So if your looking for colors like pistachio or tropical teal, then I would definitely check out there site. Speaking of PartyPail, I wanted to give you a little more info about there supplies and who they exactly are. PartyPail is a company that sells party supplies of all kinds. They sell specific supplies for parties like baby showers, kids birthdays, anniversaries etc, and they also sell party supplies that can be mix and match to fit your celebration. There prices are very reasonable and the section of colors is pretty amazing. If you want to learn more about PartyPail you can check them out on Facebook. 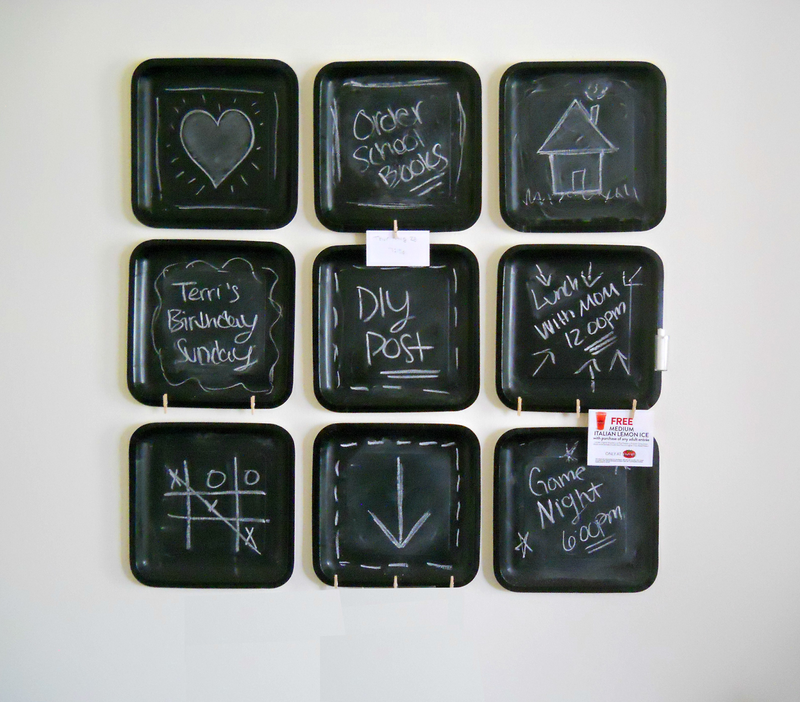 So what do you think of this paper plate chalkboard wall diy? Let me know in the comments below or leave your thoughts on the blog's new facebook page.